Lezyne’s new ABS2 chuck head transforms a good product into an exceptional one (click to enlarge). Editor’s Note: This review was originally published on June 18, 2016. After a full year of abuse, our test pump developed two issues. The first hiccup was the gauge. It stopped working. This didn’t affect inflation performance, it just meant we had to use our hands (or a digital gauge) to test for pressure before rolling out. That’s inconvenient, but not a deal breaker. Gauges fail, regardless of brand. A replacement part is available through the Lezyne website for under $20. However, this issue was covered under their two-year warranty. All it took was an email. They sent out a new gauge, some Loctite, and detailed instructions. Shortly after the gauge failed, the ABS2 chuck also died. Well, it didn’t die so much as it exploded. We were able to put it back together, but it unraveled again. According to Dillon Clapp, the Global Communications Manager, this issue only affected early units. They made a running change to production which has since resolved the problem. If you have a similar problem, send Lezyne an email. They’ll send you a replacement under warranty. Once you have the parts, swapping the head takes less than two minutes. The new ABS2 quick release chuck from Lezyne works so well it pushes a good product into the field of extraordinary. Read on to learn why. The Lezyne name has always been synonymous with beautiful design. Despite the incredible looking product however, I’ve always hated their pump heads. Rather than utilizing the same basic QR style head as most brands, Lezyne used a screw on chuck. This design guaranteed a leak free fit, but took forever to install and remove – especially if you had to switch between valve types. This system is very similar to the one employed by Birzman, but I prefer the ABS2 because it has a larger collar which makes it easier to use (click to enlarge). This all changed last year, when Lezyne released their new ABS2 chuck. 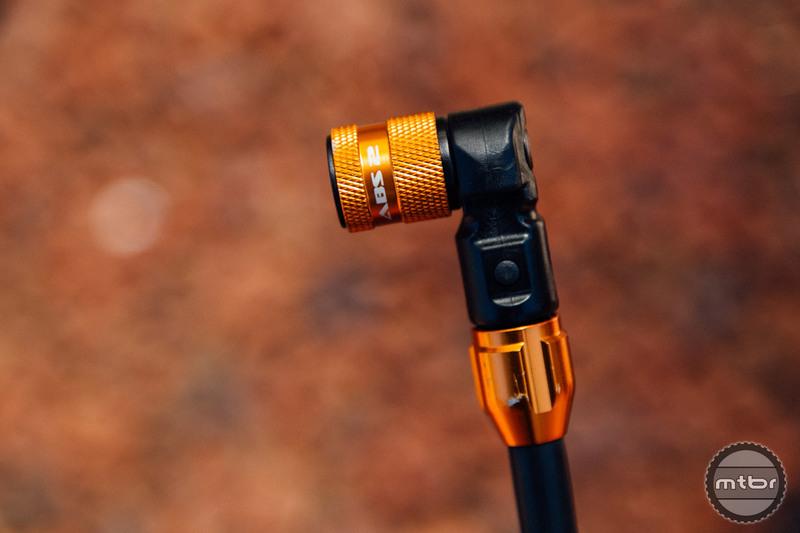 Made from a composite body outfitted with an aluminum engagement sleeve and coupler, the new design quickly affixes to both Presta and Schrader valves. It’s a little complicated to explain in just one or two sentences, so I recommend watching the video above for a full explanation. Essentially, you push the head onto the valve and give it a quarter turn to seal. To remove, you just lift up on the sleeve. Somehow this pump works even better than it looks (click to enlarge). Moving on from the chuck, the pump is standard Lezyne. 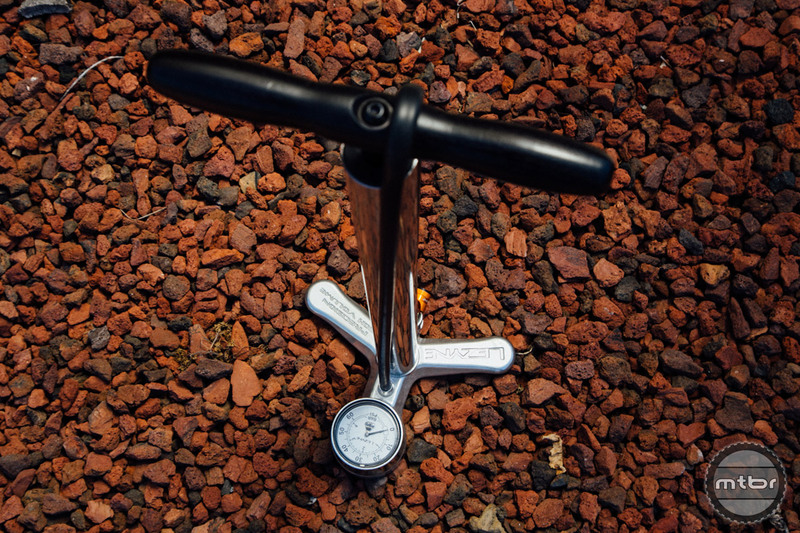 It has an ergonomic wood handle, sufficient displacement to seat tubeless tires, and a four foot long hose that can reach bikes mounted in a stand. 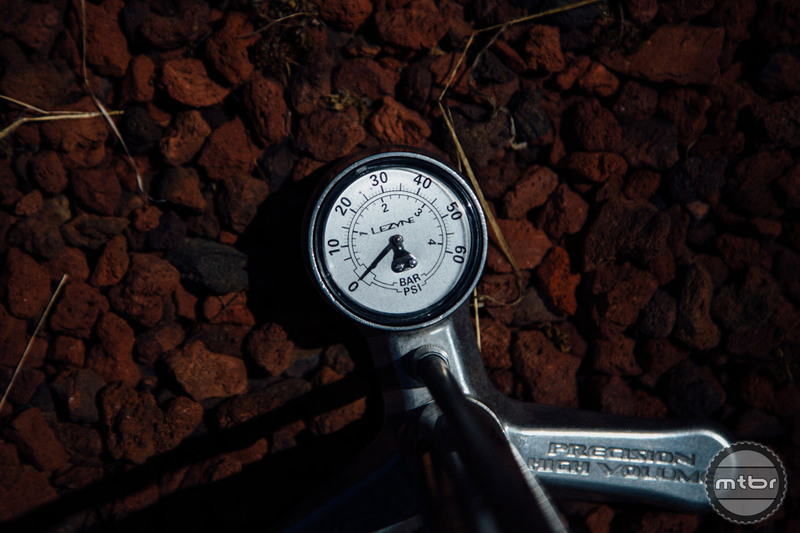 This high volume model has a 60 PSI maximum that’s best suited for mountain bike tires, but a road version that goes up to 225 PSI is also available. With a 60 PSI max, the Alloy Drive High Volume pump is ideal for mountain bike and plus tires (click to enlarge). 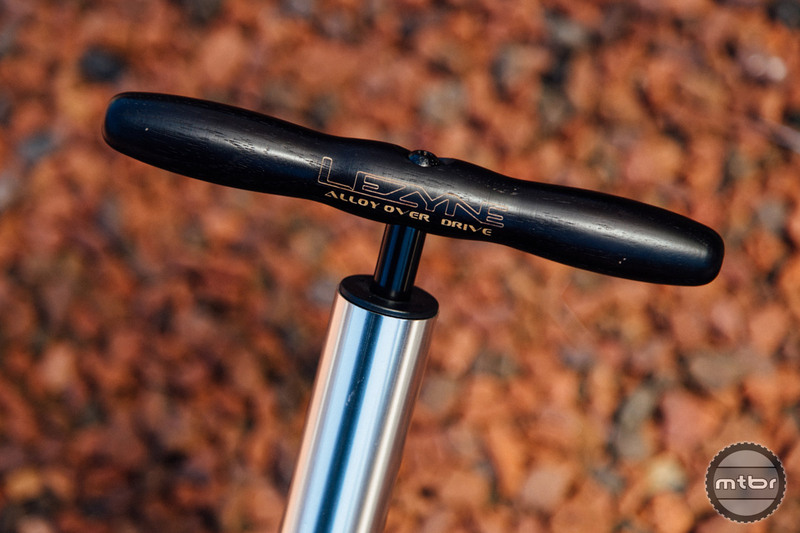 By pairing the remarkably easy to use ABS2 head with their beautifully crafted pump bodies, Lezyne has created a floor pump I actually enjoy using. If you’re in the market, I highly recommend giving the new Lezyne models a chance. There’s a small learning curve associated with the new chuck, but it’s well worth the initial annoyance. Lezyne’s new ABS2 chuck head transforms a good product into an exceptional one. This system is very similar to the one employed by Birzman, but I prefer the ABS2 because it has a larger collar which makes it easier to use. Somehow this pump works even better than it looks. 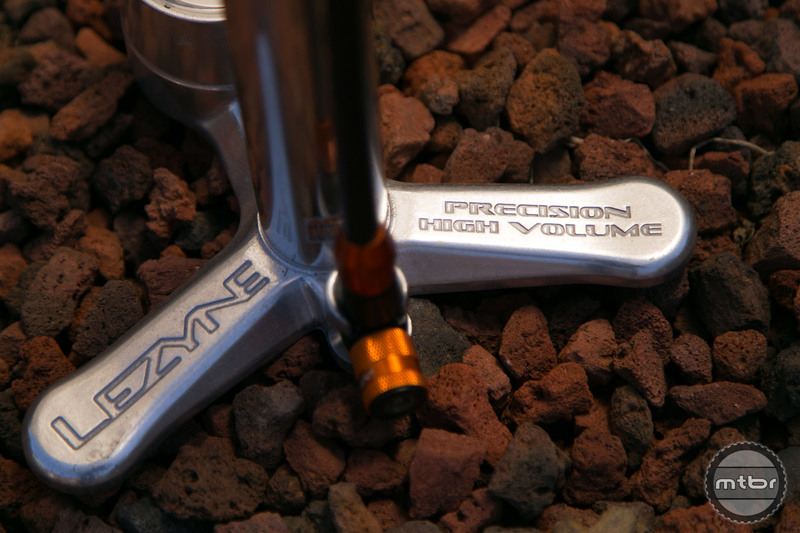 With a 60 PSI mass, the Alloy Drive High Volume pump is ideal for mountain bike and plus tires. I modified my pump with this new head also. It’s great. I’m still clumsy with it, but I really like it. Won’t loosen removable value cores, etc.